If you are concerned about having highly visible braces, then Invisalign® could be the right solution for you. Dr Peter Poulos can provide Invisalign® removable aligners that are great for correcting a wide variety of orthodontic problems. 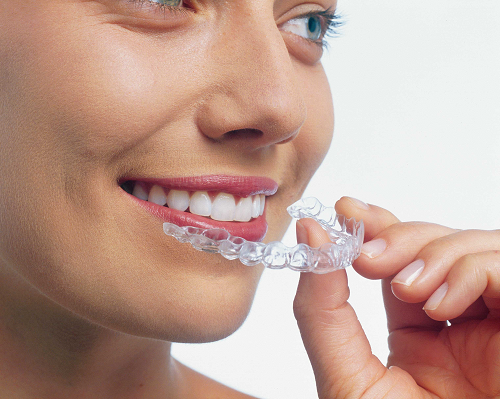 Invisalign® aligners are fully removable and are made from clear, thin BPA-free plastic. They fit tightly over the teeth, gradually moving them into their new positions that will have been predetermined in your treatment plan. You might be suitable for Invisalign® if you have problems with overcrowded teeth, or unsightly spaces in between them. Invisalign® can also correct problems with your bite, including open bites, overbites, crossbites and underbites. Dr Poulos will need to examine your teeth and he will take x-rays, impressions and photos to plan your treatment using Invisalign®’s special software. As part of this plan, you will get to see virtual images of your newly straightened smile, before treatment begins. We find our adult patients love this system, as the aligners are nearly invisible and are taken out for eating and for brushing and flossing so treatment couldn’t be easier. All you have to do is wear the aligners for 22 hours each day, exchanging each set for a fresh set every two weeks to continue moving your teeth. We will provide you with several sets of aligners, although you will need to come and see us every few weeks so we can just check your progress. Most people will complete treatment within a year, but Dr Poulos can provide a more accurate timeframe once he has assessed your smile.